After Clemson's 58–0 beatdown of Miami, it's clear the Hurricanes will never get to where they want to be with Al Golden as their head coach. 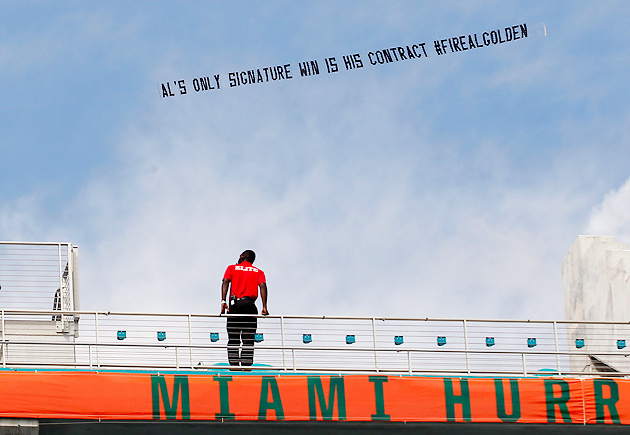 MIAMI GARDENS, Fla. — There are no excuses big enough to excuse what Al Golden’s Miami team did Saturday. The Hurricanes lost 58–0 to Clemson, passing a 1944 loss to Texas A&M for the most lopsided defeat in school history. They trailed by 42 at halftime. They looked lifeless and outclassed against a team at the level they aspire to reach. But Saturday offered definitive proof that Miami will never get there under Golden—no matter how many excuses anyone makes. Did you see that weather? Who could blame them for going to the beach instead of watching what the Hurricanes have put on the field the past few years? Miami plays seven games a year at Sun Life Stadium. If the administration wanted to, it could tarp off the entire upper deck and make every game feel full. But that really doesn’t matter. Miami has plenty to offer on those other 358 days. Players get to live in Coral Gables and use recently upgraded facilities. And if they are coached properly, they’ll win and play in front of better crowds. There won’t be Ohio State crowds. This is South Florida, after all. But a passionate 40,000 is plenty. Miami is a small private school that doesn’t have the money of a football factory like Clemson or Alabama. If a small private school in Waco, Texas, with hardly any winning tradition can become one of the nation’s best programs, a small private school in Coral Gables, Fla.—sitting in the richest football recruiting territory on the planet with five national titles since 1983—can compete for championships. And not necessarily national championships. Let’s start with the ACC Coastal, which Miami could win next year if its administration wakes up and realizes the program needs different leadership. Rich Rodriguez makes $2.5 million per year—more if you count an oil and gas investment vehicle that kicks in if he stays until 2022—and is frustrated with the way the Pac-12 treats his team. He might listen. Or what about North Carolina’s Larry Fedora, who has been trying to recruit and coach through a scandal he had nothing to do with but also can’t escape? Under other circumstances, he might already have the better job. But now? He might listen. What about Justin Fuente at Memphis? He may have coached his way into a better job at this point, but anyone who can navigate the recruiting cesspool in Memphis could handle the equally unique South Florida ecosystem. How about Tom Herman at Houston? Miami athletic director Blake James needs to at least gauge his interest. It’s Herman’s first season as a head coach, but his handling of the Ohio State quarterback situation as the Buckeyes’ offensive coordinator last year looks more masterful in light of what’s happened so far this season in Columbus. Or what about Bowling Green’s Dino Babers, who could load up his version of the Art Briles-Baylor offense with South Florida talent? The end goal, obviously, is to help speed along a coaching change. James obviously knows that. If he doesn’t want it to seem as if he’s firing Golden to appease a vocal wing of the fan base, he doesn’t have to fire Golden to appease a vocal wing of the fan base. He can fire Golden for losing too many games and for not having his team ready to compete against the best teams in his conference. The Hurricanes are 0–5 against Florida State under Golden. Against Clemson, the presumptive ACC favorite and a potential College Football Playoff participant, Miami looked like an FCS team. We know Miami has good players. Seven players were drafted off a team that went 6–7 last year. About 90 percent of the coaches in the country, if given a truth serum, would admit that they’d trade their starting quarterback for Kaaya. This team can win, and soon. It apparently just can’t do it for Golden and his staff. Going into the game, Golden thought his team had practiced well. Clemson coaches were nervous because they saw athletes on film that—unlike most of the Tigers’ opponents—might be able to match up. Forty-eight minutes of football later, Clemson’s third-team quarterback (Kelly Bryant) was running for a 59-yard touchdown. Golden deserves credit for shepherding Miami through a rough stretch following the NCAA investigation produced by booster/pyramid schemer Nevin Shapiro’s confessions. Golden is, by all accounts, a decent human. But the same is true of Will Muschamp and Brady Hoke. No matter what athletic directors say, that isn’t why they pay football coaches millions of dollars. They pay them to win. Miami’s NCAA penalties weren’t that severe, and once the case closed, the Hurricanes should have begun progress toward the top of the ACC. Instead, they learned Saturday just how much distance separates Miami and the best team in the conference. Miami remains mathematically alive in the ACC Coastal, and all five of the Hurricanes’ remaining games will come within the division. Theoretically, they could still play for the ACC title this year. Realistically, that would take a miracle—especially if the concussion keeps Kaaya on the shelf for any length of time. Miami players haven’t quit yet, even if it might have looked that way Saturday. They still have pride. Otherwise they would have slunk back to their locker room instead of standing on the field where they’d just been humiliated as the band played the alma mater. After they finished, the Sigma Chis fired the “Touchdown Tommy” cannon on the other side of the field. It had plenty of powder, because the gentlemen of the fraternity hadn’t needed to fire it all day.